I consider this 17th day of my U2 360 tour across America the end of the first part of my road trip. My mom and aunt left today – they had been with me since the beginning. We had breakfast in our hotel and then went back to the fabulous Grand Sierra Resort to gamble for a couple hours before their flight. Luckily I won back my money that I lost yesterday. After I dropped them off at the airport, I went to Petco to get dog food for Elvis and Cilla, got gas for our trip tomorrow, and went to Subway for lunch. I was back at the hotel by 1. 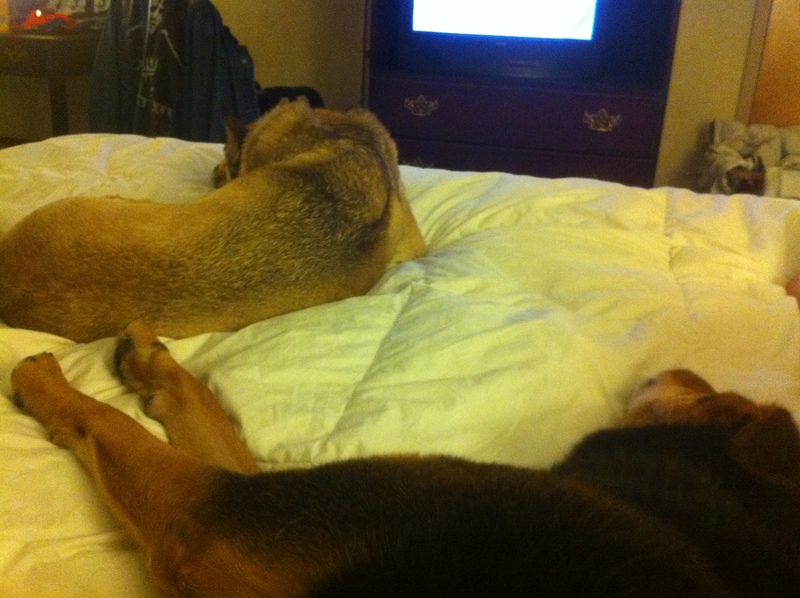 Elvis, Cilla and I are just going to relax for the rest of the day before our long drive to Portland tomorrow. 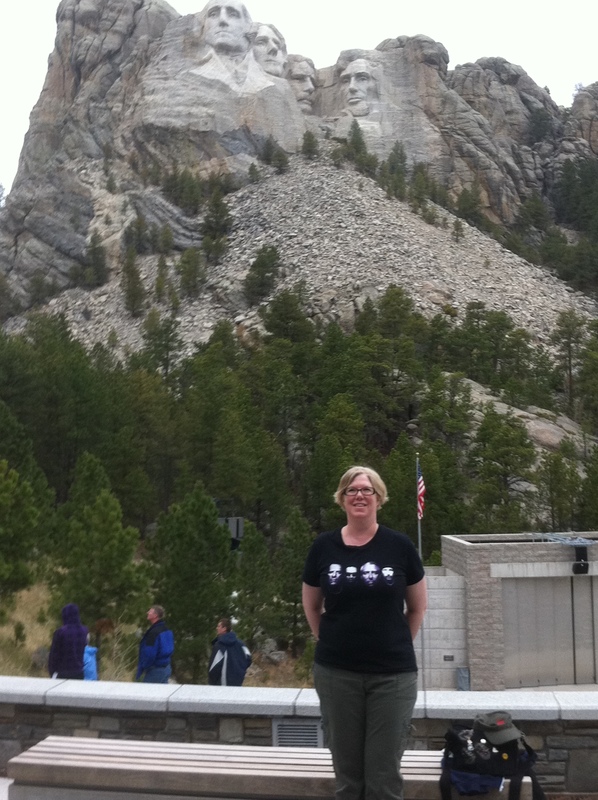 I had a great first part of my U2 360 tour across America road trip. 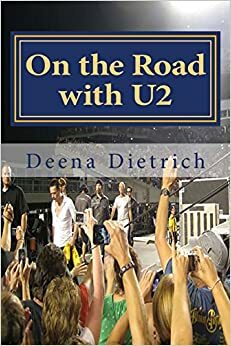 It was only 2 U2 shows, but I still consider it the first part of my road trip because tomorrow is the last day of May and my mom and my aunt were with me the first 17 days, and they went home today. We had a great time touring Omaha, Mount Rushmore, Crazy Horse, Keystone, Deadwood, Denver, Salt Lake City, Reno and Lake Tahoe. My favorite was Mount Rushmore. It was beautiful, and we had a great day walking through the park. Both U2 concerts in Denver and Salt Lake City were great. I got a lot of Larry love at the opener in Denver, but the audience wasn’t that into the show. The crowd was much better at the show in Salt Lake City, but Larry didn’t even know I was there. The set lists were pretty much the same for both shows, except Love Rescue Me was played at the Salt Lake City show. I watched the Denver show with my old friend Mike, but lost him in the beginning of the Salt Lake show. I got to hang out with my Elevation friends Matt and Melissa during the Salt Lake City show. I’m enjoying the new set list on this leg of the U2 360 tour with the exception of the void of my favorite I Still Haven’t Found What I’m Looking For – but I’m loving the addition of Pride. 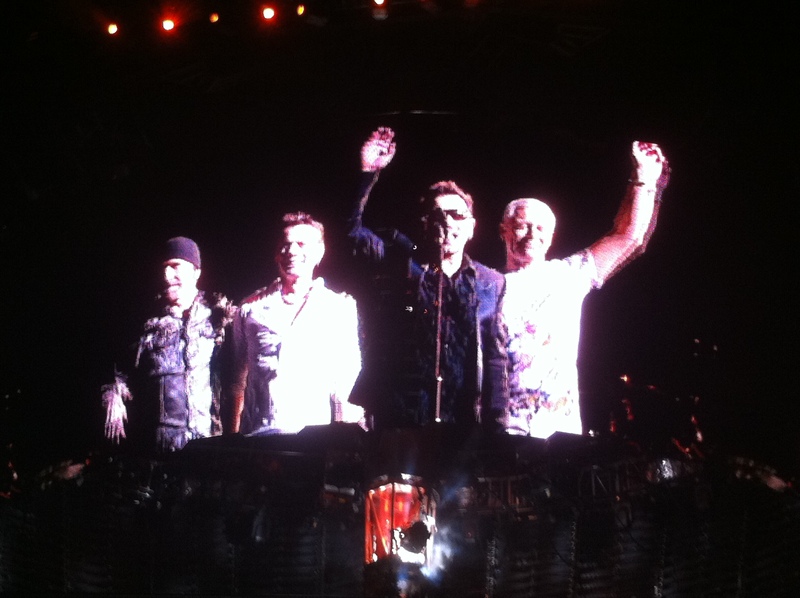 14 more shows to go on my U2 360 tour across America. Part 2 will be those in June in Seattle, Oakland, Anaheim, Baltimore, East Lansing, and Miami. And along the way I’ll also visit Portland, San Francisco, Palm Springs, the Joshua Tree, and Hollywood – as well as a really long drive across the country. 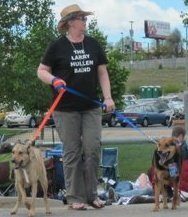 Please look for me, Memphis Mullen, in my Larry Mullen Band shirt with my dogs Elvis and Cilla in a GA line near you. It’s on to Portland, Oregon in the morning! 5 days until U2 360 in Seattle! On my trips I have never considered following a band across the country, but that sounds like a lot of fun. Seeing the country, plus great music all the way.